Are you ready to learn about one of my most favorite and fun products this year? I am so excited to share with you Wee Can Too art supplies because they are so unique! Are you ready for this....they are paints and art supplies that are SAFE and EDIBLE!!! They are even made from ORGANIC ingredients! It doesn't get much better than that!!! Wee Can Too was founded in 2007 by a momma who sought a safer and more nutritious art product for her infant daughter... Voila... Edible Art Supply was born! The eco friendly, organically edible paints are amazing. They are completely safe for your kids and edible in case they decide to put their little hands into their mouth, which has been known to happen while fingerpainting. 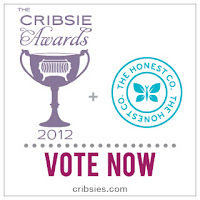 Most exciting is that their products are up for two Cribsie awards!! Their Original Naturally Safe Fingerpaint is a finalist in the “Nicest Toddler Paints That Don't Require A Gas Mask”, in the “Play” category and also for their chalk and crayons in the “New Arrival” category. If you are loving these awesome and SAFE art supplies as much as I am, make sure to show your support and click on the button below to vote!! Let's face it, with infants and toddlers these days, everything ends up in their mouths. Well now all of us parents can relax because Wee Can Too has our back and has made art supplies that are safe and worry-free! They are actually for curious mouths and made with food-based organic ingredients. That is just so amazing to me that a mother cares so much for not only her children, but ours too, that she created such fun and safe products - even made with organic ingredients to make them especially safe in case they make their way into your baby's or toddler's mouth! 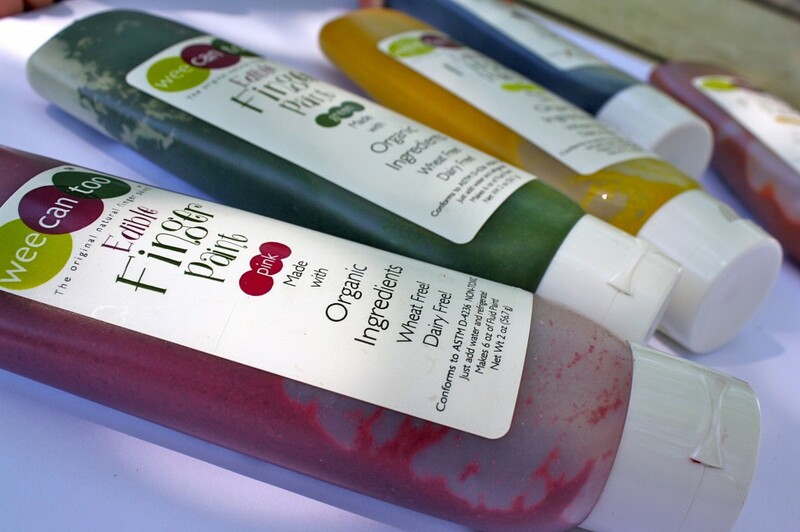 I received some great products from Wee Can Too: The Original Naturally Safe Fingerpaint - Tottle Set, Edible Veggie Sidewalk Chalk- The Swirl, the Veggie Tempura Paint and the Nature's Magic Egg Dyeing Kit! They all look so much fun and also look quality made and made in quantities that will last a long time! Most importantly, I never have to wonder what harmful chemical are being absorbed into their skin while they are painting, drawing or dying because these art supplies are all-natural and safe! I love the Grab n' Go containers because I can mix up only as much as I need for our art projects! They make several great colors of paint to choose from and they are even safe for babies! I just can't get enough of these art supplies! If your child loves to paint, draw, and dye Easter eggs, then you have GOT TO head over to Wee Can Too and check out their safe, natural AND organic art supplies for all ages and art projects! Buy It: You can purchase all Wee Can Too art supplies on the Wee Can Too website or in a local store near you! Win It: Wee Can Too is generously offering (1) The Original Naturally Safe Fingerpaint - Tottle Set to a lucky winner! Sorry, I accidentally listed We Can Too as another giveaway I entered, I meant to say Olive Night Cream.